This is a re-release of the impressive "Rustel Angel" album. It's only been about three years since its prior U.S. release, but it would be a travesty to let an album this good go out of print for too long. 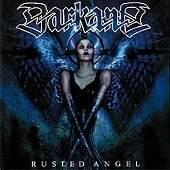 DARKANE's brand of metal is going to kick you in the teeth and leave you begging for them to do it again. With a constant awareness of technical virtuosity and melody (ala the Swedish sound) DARKANE meld a fierce combination of death metal fury, black metal insanity, and speed metal vibes. Their vocalist Lawrence Mackroy juggles his delivery so that at any given moment you don't know whether he is going to be growling, screeching or singing. The music is almost always ripping along at full throttle but in the mayhem there is not one single moment where the sound feels out of control of disconnected. There is never a use of speed just for the sake of being fast, instead the band takes speed and uses it to enhance the hooks and melody of the music.